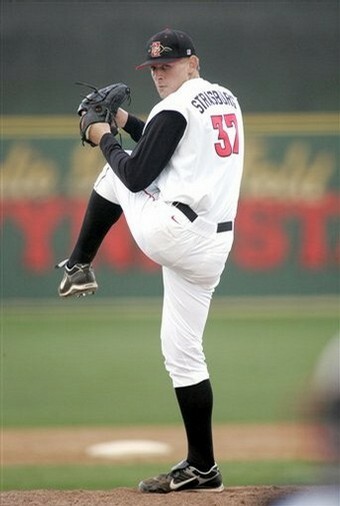 Stephen Strasburg: Myth or Man? Baseball is going through a rough week, but I’m not about to give up on enjoying the game. Nowhere close. Call me a hopeless optimist, but I have a remarkable ability to enjoy baseball, regardless of whatever negative media frenzy might be going on. The timing actually couldn’t be better this week, as I’ve got the perfect antidote: Stephen Strasburg. There are few things sports fans love more than watching a young kid come up from scratch, and establish himself into a star. In the case of Strasburg, by all accounts that’s essentially guaranteed, and we’re left to guess just how good he’ll be (not to put too much pressure on the guy, but he seems to be handling it all quite well). Whoops. I’m two paragraphs in and being a blogger/sportswriter, I haven’t turned on the patented Strasburg hype machine. For those who are unaware, here’s the real essence of the story: he throws 98-101 mph regularly, and can crank it up to 103 mph. That would be amazing enough (especially considering he’s a starter, and not a reliever who goes in and cranks up the heat for just three outs), but here’s the kicker: that ridiculous fastball has movement to go with the velocity. As a standard rule, if you throw a baseball that reveals triple digits on a radar gun, it’s not going to “move” much before it gets to the catcher’s mitt. It’ll be straight as a line. Typically, this doesn’t matter much if you throw that hard, but it does if you’re a typical human being. So wisely, “normal” pitchers will often sacrifice a little velocity if it means getting more movement on their pitches. Defying most logic and physics, Stephen has both. What results is more Playstation than reality, but this modern day Sidd Finch does truly exist. Oh, and as if the other-worldly fastball wasn’t enough, he mixes in an incredible plus slider at 81-84 mph, a plus changeup, and a curveball that clocks in the 70s. Put yourself in the shoes of a batter for a moment, and realize that you need to guess on any of these pitches. Here’s some assistance. It’s just all kinds of unfair, and you actually see the batter’s will crumbling as the at-bat goes on. This, my friends, is the baseball equivalent of a mythical Bigfoot or Loch Ness Monster video, except it’s real. Prior to broadband technology, if I told you about the contents of this video, you’d call me a liar. This is Strasburg striking out 23 batters in a game against Utah. The crazy part, really, is that the 23 strikeouts are secondary to actually seeing the full arsenal of pitches he has. As soon as you see the sick movement on the second pitch in this clip, you pinch yourself and wonder if you’re watching a video game. Then you remember he’s throwing against college kids, and truly feel bad for them. Not to disparage the fine Utah Baseball program, but this might as well be Johan Santana against your kid’s Little League squad. Which brings us to the real hype. By all accounts, according to scouts across the board, you could slot Strasburg into a major league rotation today, and he’d make an immediate impact. The Washington Nationals have the first pick in this year’s draft, and given that they desperately need pitching and a face of the franchise to establish their fan base and sell tickets, they’re all but guaranteed to take him. With Scott Boras as his agent, and understandably already asking for the biggest contract ever given to a drafted player, there should be plenty of drama after draft day. But I fully expect that after all is said and done, Strasburg will be wearing National red. I’m aware that much of the copy above contradicts my previous posts on how fans need to be more patient with their pitching prospects, but I’m sorry. I just can’t help myself. Regardless of what happens from this point forward, Strasburg is probably the most hyped pitching prospect in the history of baseball, and that can’t be taken away from him. And I can’t wait to see him pitch in person tomorrow. One thing that’s probably lost in all the hype is that Stephen Strasburg is from San Diego. He goes to college right down the road from our office, at San Diego State University (where none other than Hall of Famer Tony Gwynn is the team’s coach). The same college, by the way, that both of his parents attended. So, tomorrow I’ll make the drive down I-5 South and witness some history as he makes his last regular season home start, here in his own community. With my trusty laptop and camera, I’m hoping to bring you some stories from the field and the game. I’m sure the national media will be out in full force, so I’ll do my best to keep a professional demeanor. But readers, you now know better. I couldn’t be more excited.